"How to make a living as an artist was an open question and a real mystery." "Censorship, curating, and instincts in collision were a challenge at Times Square Show." 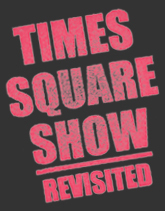 "The Times Square Show exposed a moment that was really new, when artists were not relying on the market or established gallery scene." "It was a thrill to be part of artist-run events, haphazard though they often were. There was a camaraderie and a "we&apos;re in it for the helluvit" feeling that was shared by everyone." "What people don&apos;t realize is that there were multiple shows going on besides the art show. There were performances, there were music shows, there were film screenings every single night"